I have sold a property at 14 4285 SOPHIA ST in Vancouver. Rare opportunity to own a tastefully renovated and bright 2 bedrm & den (den easily converted to 3rd bedrm) 2 bathrm townhome just steps from the restaurants and shops of vibrant Main Street. Luxurious updates include: custom design kitchenwith marble counter tops, stylish bathrooms with marble flooring & rain showers, hardwood flooring, crown molding, custom wooden blinds & doors. The wood burning f/p with antique mantle will keep you warm in winter. In summer the beautifully landscaped, private outdoor patio & garden space makes entertaining a pleasure. Your home is situated in quiet & safe surroundings, just a 10 minute walk to skytrain & 10 minute drive to downtown. Comes with 2 secured underground parking. VANCOUVER, B.C. 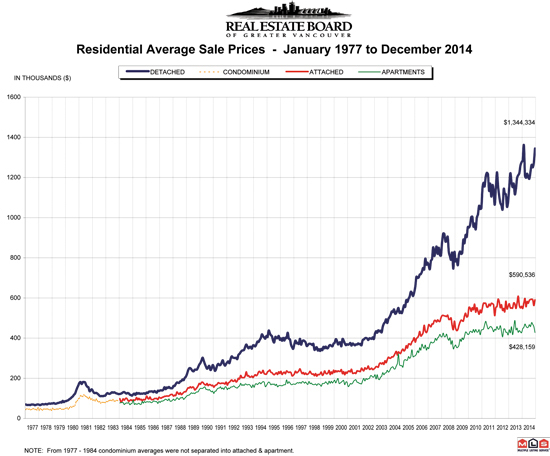 – January 5, 2015 –It was a typical year for the Metro Vancouver housing market in certain respects. The region’s home sale and listing totals for 2014 both rank fifth when compared against the past 10 years of activity, while home prices increased. The Real Estate Board of Greater Vancouver (REBGV) reports that total sales of detached, attached and apartment properties in 2014 reached 33,116, a 16.1 percent increase from the 28,524 sales recorded in 2013, and a 32.3 percent increase over the 25,032 residential sales in 2012. The number of residential properties listed for sale on the Multiple Listing Service® (MLS®) in Metro Vancouver increased 2.4 percent in 2014 to 56,066 compared to the 54,742 properties listed in 2013. Looking back further, last year’s total represents a four percent decline compared to the 58,379 residential properties listed for sale in 2012. The MLS® Home Price Index composite benchmark price for all residential properties in Metro Vancouver ends the year at $638,500. This represents a 5.8 percent increase compared to December 2013. Residential property sales in Greater Vancouver totalled 2,116 in December 2014, an increase of 8.3 percent from the 1,953 sales recorded in December 2013 and a 15.9 percent decline compared to November 2014 when 2,516 home sales occurred. New listings for detached, attached and apartment properties in Greater Vancouver totalled 1,888 in December 2014. This represents a 1.7 percent increase compared to the 1,856 units listed in December 2013 and a 37.4 percent decline compared to November 2014 when 3,016 properties were listed. The total number of properties currently listed for sale on the MLS® system in Metro Vancouver is 10,320, a 10.7 percent decline compared to December 2013 and a 17.8 percent decrease compared to November 2014. Sales of detached properties in December 2014 reached 833, an increase of 9.3 percent from the 762 detached sales recorded in December 2013. The benchmark price for detached properties increased 8.1 percent from December 2013 to $1,002,200. Sales of apartment properties reached 912 in December 2014, an increase of 7.3 percent compared to the 850 sales in December 2013.The benchmark price of an apartment property increased 3.5 percent from December 2013 to $380,700. Attached property sales in December 2014 totalled 371, an increase of 8.8 percent compared to the 341 sales in December 2013. The benchmark price of an attached unit increased 4.5 percent between December 2013 and 2014 to $476,800. I have sold a property at 401 360 36TH AVE E in Vancouver.